Aloe Vera Gel & Juice by Nature's Way is very nice for conditioning curly hair! 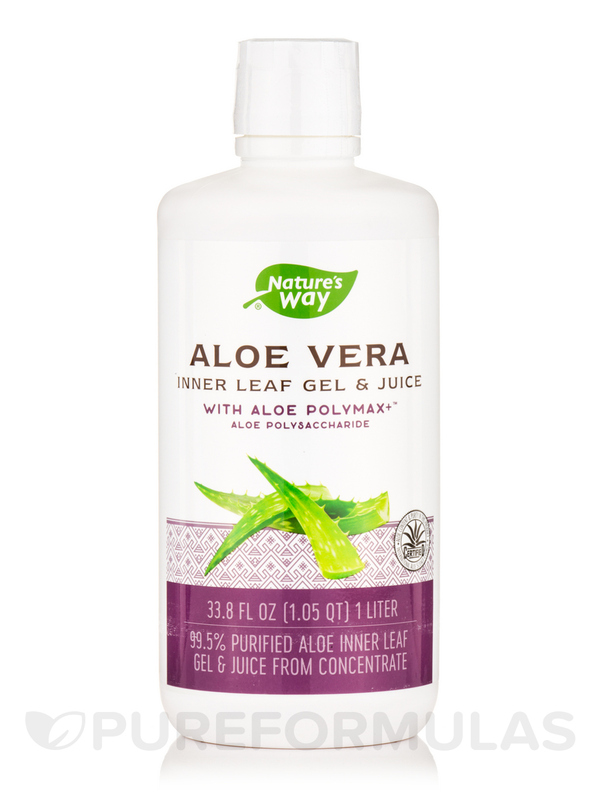 Anytime I have intenstinal discomfort Aloe Vera Gel & Juice by Nature's Way is my go to product! I just started taking Aloe Vera Gel & Juice by Nature's Way, and Taste is not that bad I was actually expecting something worse. Way Aloe Vera is bottled using a unique nitrogen process to eliminate oxidation and preserve potency. Ingredients: Purified water‚ aloe vera inner leaf pulp‚ aloe vera leaf juice‚ preservatives to maintain freshness (citric acid‚ potassium sorbate‚ sodium benzoate)‚ organic Aloe PolyMax+™ containing polysaccharide. Great flavor easy and to take. Take Aloe Vera Gel & Juice by Nature's Way every day for better health. Aloe Vera Gel & Juice by Nature's Way is good for everything for health. I read that drinking twice a day aloe vera can help heal with a small hernia and I've seen improvement in a couple of months. The taste is very acidic. Not sure if all aloe vera juice tastes this way as this is my first time drinking Aloe Vera Gel & Nature's Way, but the taste is very acidic. They have added citric acid so that may be why. I like the way Aloe Vera Gel & Juice by Nature's Way taste and the ingredients! I had purchased this brand before and like the way it made me feel but this one with the additional ingredients is better! Taste and the another aloe ingredient! I used Aloe Vera Gel & Juice by Nature's Way in daily hair care I mixed in a spray bottle, it does a beautiful job rejuvenating my curly hair I usually only wash my hair once a week..spritzed on, helps the curls stay fresh. When used as a curl refresher, does not weigh my thin hair down. Moisturizing without a greasy feel.. Wished that it was a little more gel like. I love Aloe Vera Gel & Juice by Nature's Way. The size was bigger than I expected so I'm happy. Now I can do all my natural hair recipes. I read many reviews about Aloe Vera for natural hair and I thought to give it a try. I mixed the gel/juice with my shampoo as well as my conditioner and I noticed my hair getting frizzy. I dont know if I was not suppose to mix it but Im not doing it again. Is the consistency of this product less viscous than traditional 99% aloe gel, because this product contains the aloe juice? Thank you for your question, Saabria. At this time, we have not received feedback that would help advise of the consistency. We apologize for any inconvenience that may cause.